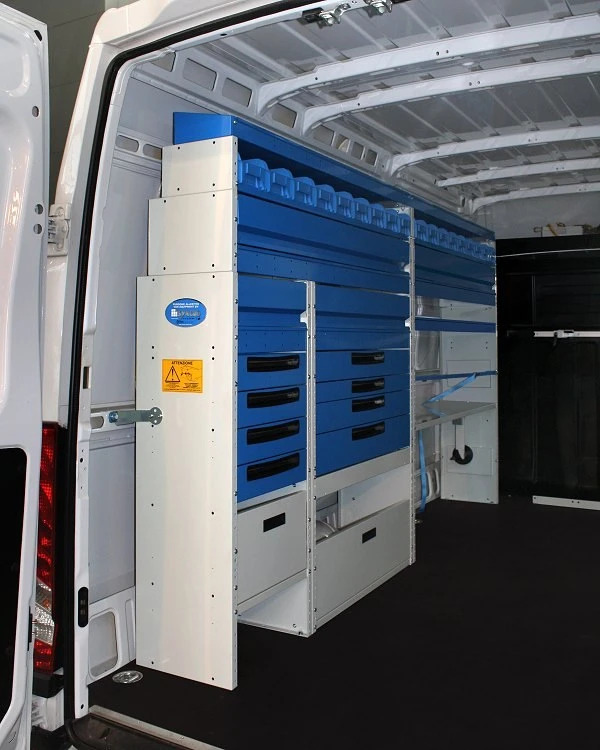 The Syncro System Group has been developing innovative commercial vehicle upfit solutions since 1996. 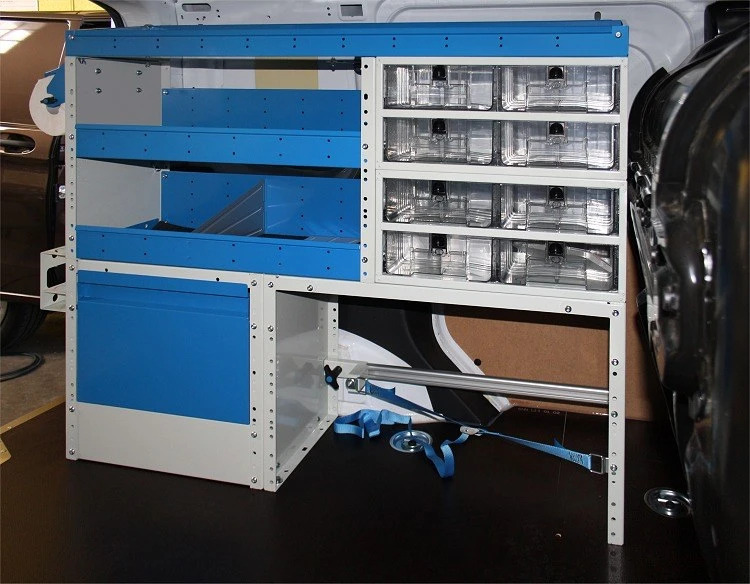 Our products include shelving, drawers, linings, ramps, trays, toolboxes and everything else needed to install a safe, ergonomic and efficient mobile workshop. 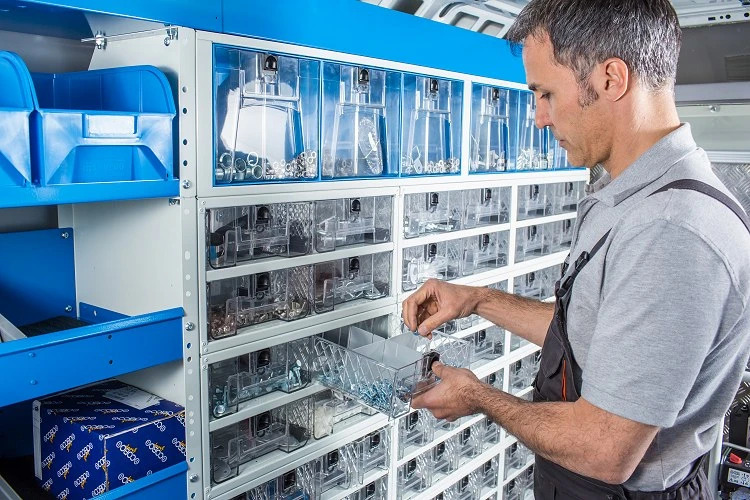 The innovative MULTIBOX range of drawer cabinets with transparent removable drawers is the perfect solution to the needs of customers who have to carry lots of small and medium size components in an orderly manner. The drawer runners are made from a special wear resistant and self-lubricating material. A special spring warns users when the drawer is approaching its fully open position. Applying slightly more force opens the drawer fully while tilting the drawer upwards lets you remove it completely. 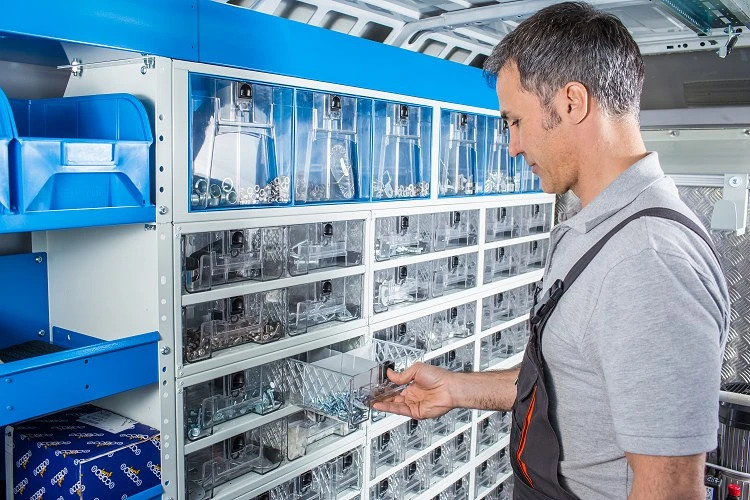 The robust drawers are made from impact and oil-resistant PMMA plastic and are fitted with an automatic locking button and a system that prevents accidental opening. 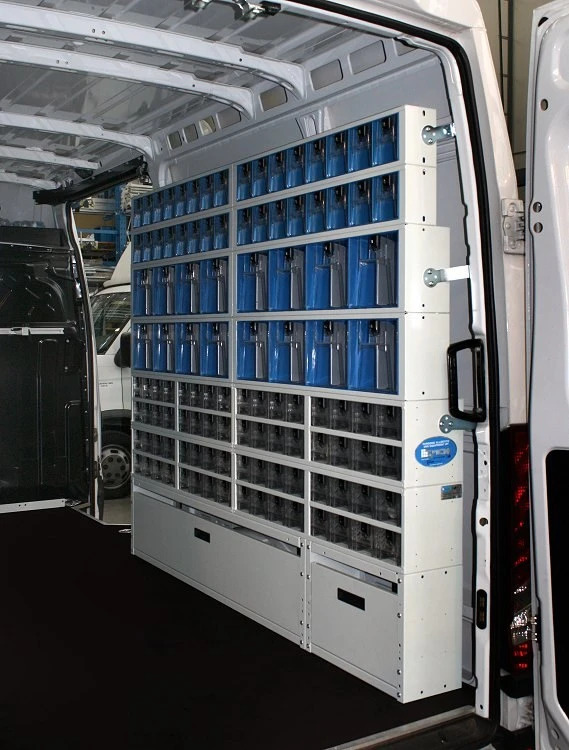 Modular sizes make the high strength steel cabinets compatible with all other Syncro System components. 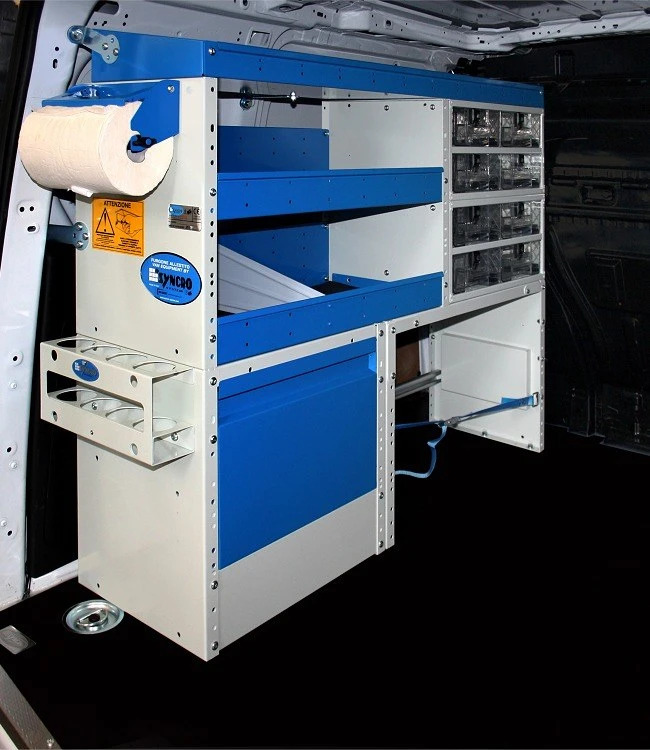 These cabinets can be installed in all types of van and in a wide range of combinations to suit user needs. 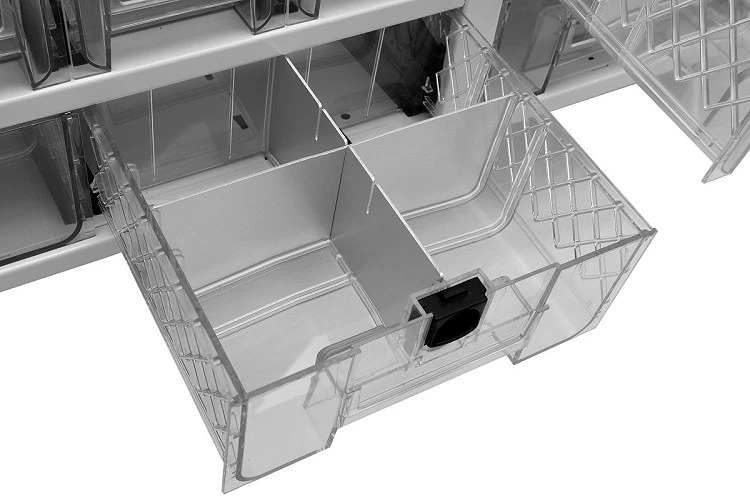 The front of the drawer has no protruding parts, eliminating the risk of impacts and breakages. An exclusive Syncro System patent! CE marked and with a three-year warranty. 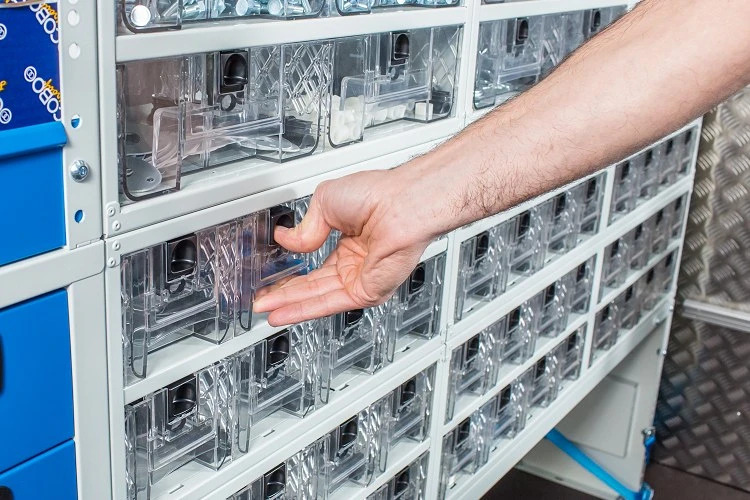 The transparent drawers are made from PMMA, the same durable and unbreakable material used for aircraft and submarine windows. PMMA is not sensitive to UVA radiation and therefore not subject to the ageing phenomena that plague poor quality plastics, turning them yellow and fragile over time. PMMA is also environmentally friendly and resistant to most common chemical products. Clearer, lighter and tougher than most other transparent plastics! This new generation of drawers is totally transparent, making it easy to see exactly what is inside. And finding what you need quickly means increased productivity in your daily work. These are photos of an upfit in a Ford Connect. 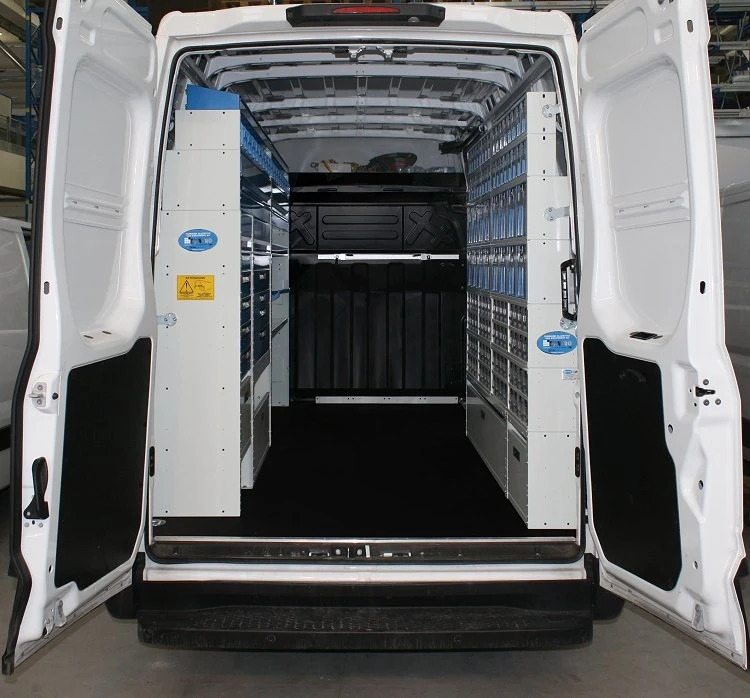 The bottom section is formed by two wheel arch covers, one with a slide and rotate door and the other with a tool case shuttle. The top of the configuration consists of three shelves and two drawer units, each containing four transparent drawers. The upfit is completed by a plywood floor panel, paper roll holder and a rack for spray cans. Note how the drawer cabinets combine perfectly with the other elements. 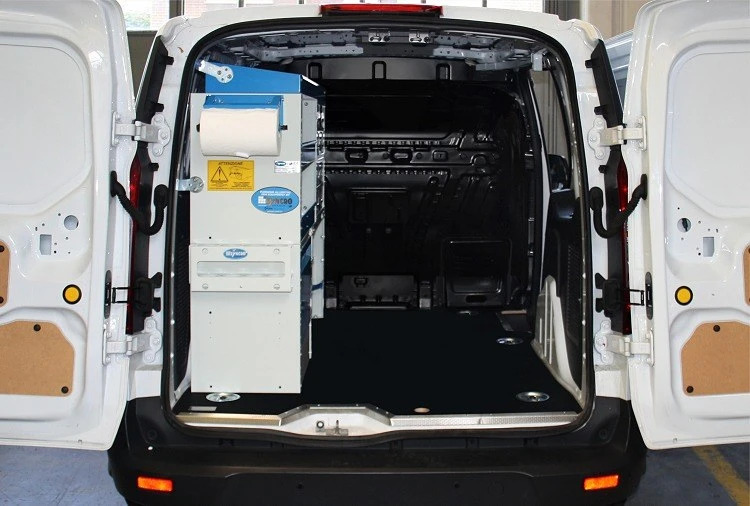 This upfit is installed in an Iveco Daily. The floor is protected by a plywood panel. 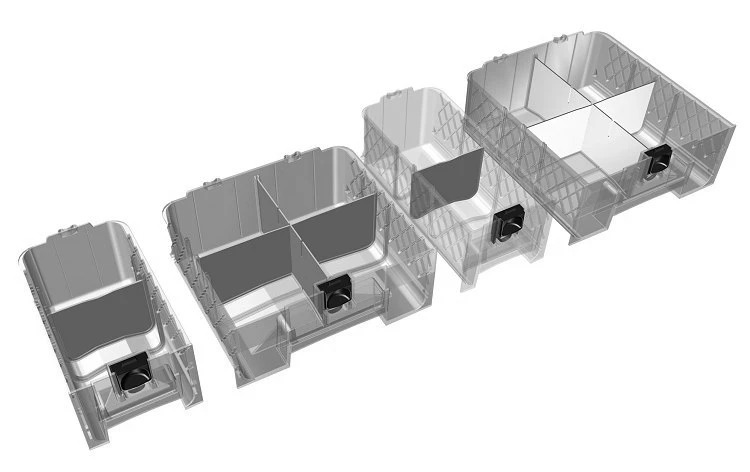 The configuration on the left side consists of compartments with slide and rotate doors, open compartments for tool cases, shelving, metal drawers and removable plastic containers. The right side is assembled almost entirely from transparent drawer units. 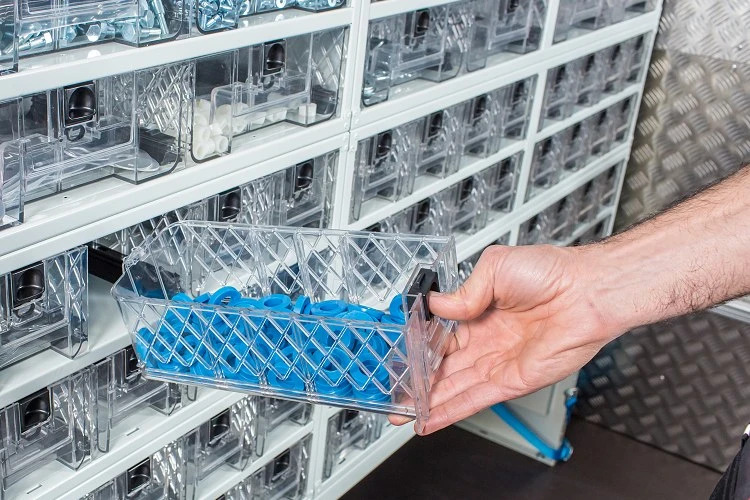 The base consists of compartments with fully opening doors, but above is a configuration of Multibox drawer units with 64 transparent removable drawers. 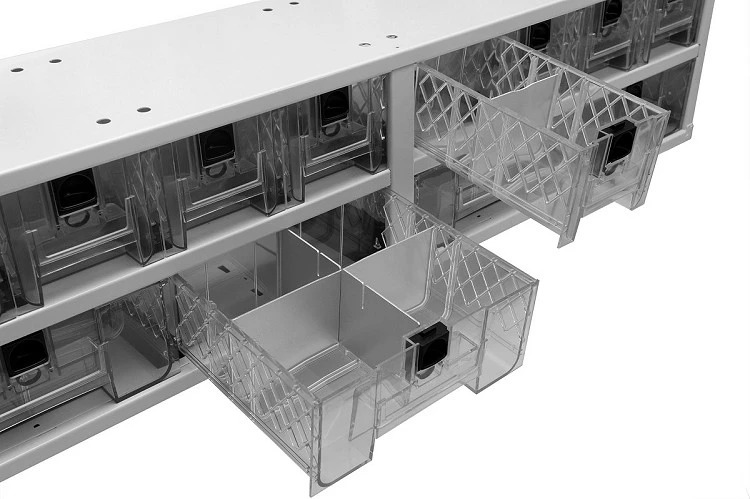 The upfit is completed by a second series of drawer units containing a total of 48 tilting drawers. 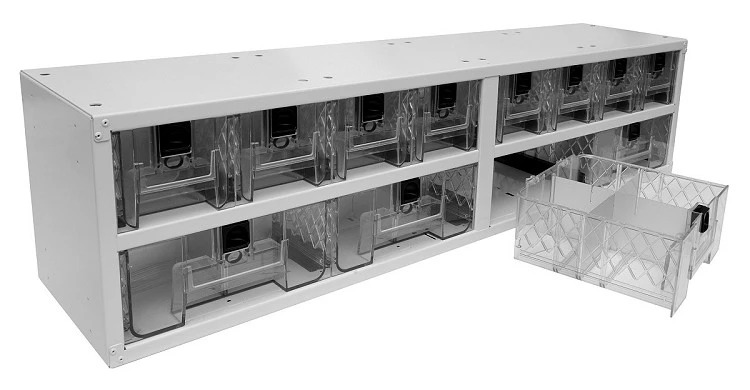 Syncro System has launched his innovative drawer units manufactured in plastic and steel.